This unique Revolving Picture Frames with Stand can display up to 4 individual 5 x7 photographs. 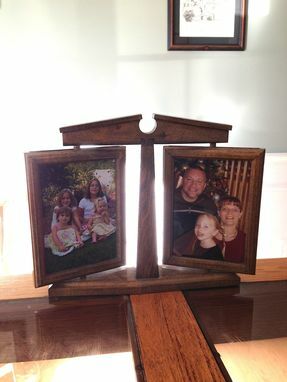 It is made from poplar, stained a dark walnut, and given several sprayed coats of a satin polyurethane finish. Pictures can be changed out by removing the frames from the stand and accessing them through slots in the top of each frame.